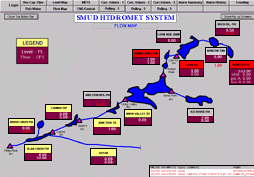 A network of 60 CR10X-based monitoring stations was installed by the Sacramento Municipal Utility District (SMUD) to provide information essential to the effective operation of a hydropower plant. The stations monitor hydrological and meteorological parameters including rainfall, water temperatures, and water levels of rivers and steams. One station monitors water level of a river and provides gate control to ensure levels are high enough to maintain a viable habitat for fish. Data are transmitted via radio and microwave communications to a computer in Sacramento running Wonderware's InTouch software.